The reign of England’s Queen Victoria was a golden era for jewelry, a time when developments in technology and craftsmanship made jewelry more beautiful than ever, while making it more affordable. Previously only worn by aristocrats, fine jewelry became accessible to the middle class that was emerging in Europe and the United States. By all accounts, Queen Victoria was very much in love with Albert, and that love story is reflected in the jewelry of the early Victorian period. Victorian necklace designs often feature bows, flowers, birds, and hearts, as well as snakes, which were seen as symbolizing eternity. The engagement ring Albert gave to Victoria featured a serpent with emerald eyes (emeralds were Victoria’s birthstone). Increased global trade meant that a new a wealth of colored gemstone options were available to jewelers. Widely used gemstones included amethyst, topaz, garnet, emeralds, rubies, sapphires, and turquoise. Victoria gave her bridesmaids gifts of brooches shaped like birds and covered in turquoise, perhaps because bright blue is said to have been her favorite color. Pearls were also very popular, and often many small seed pearls were used to create intricate and feminine designs. Because the technique of farming cultured pearls was not yet invented, even the tiniest pearls were precious and valuable. The discovery of a large supply of diamonds in Brazil, and later another one in South Africa, made diamonds more available than ever before. However, these gems were still rare and expensive, and worn for the most formal occasions. 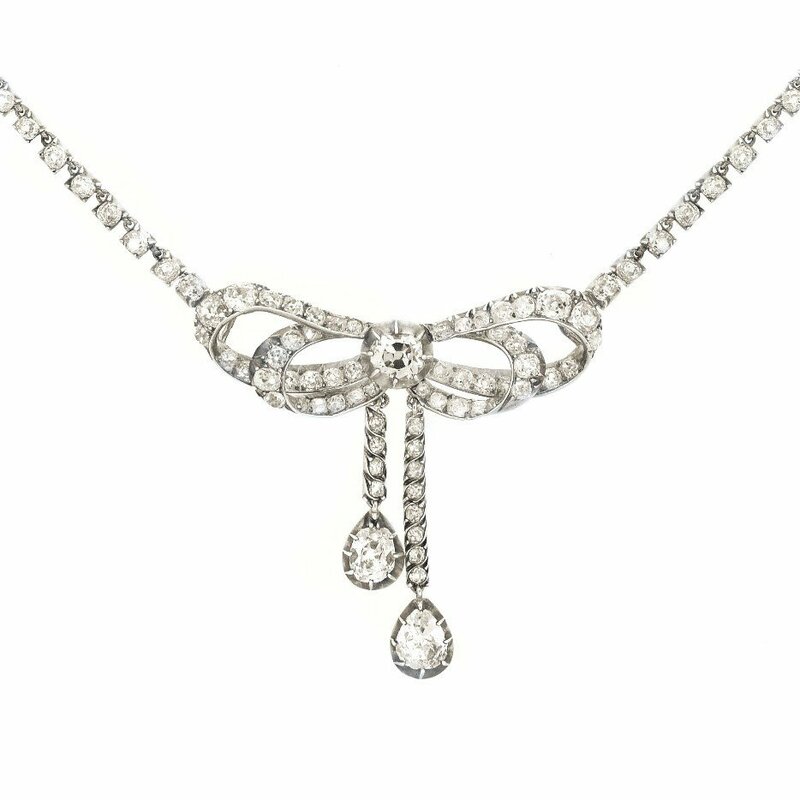 Rose cut diamonds are often seen in early Victorian jewelry, with old mine and old European cuts (precursors to today’s round brilliant cut) common in the later decades of the 19th century. The discovery of large gold deposits in California in 1849 and in Australia in 1851 led to a boom in gold jewelry production. Jewelers used both yellow and rose gold, often engraved or embellished with filigree. Silver was also popular, but platinum was not widely used in jewelry until the Edwardian era, when new metalwork techniques allowed it to be sculpted on a small scale. Motifs and colors used in Victorian jewelry were often meant to convey specific meanings. The Victorians believed in a “language of flowers,” with each flower (and flower designs in jewelry) carrying symbolic meaning. Roses were associated with romantic love, lilies with beauty, mimosas with chastity, and lilies of the valley with a return to joy. Similarly, gemstones were believed to have special meanings—garnet symbolized loyalty and fidelity, for example. When somebody died during the Victorian era, the family members were expected to observe a strict mourning period and dress accordingly. That meant black clothes and, for the women, limited jewelry options. Victorian jewelry characteristics for mourning times included the use of dark materials like black jet, and often contains seed pearls, which represented tears. During the Grand period, much of Victorian jewelry resembled mourning jewelry, reflecting the queen’s grief over the loss of her husband. Wreathes, branches, leaves, shafts of wheat, berries, and other designs drawn from the natural world were popular motifs. These designs echoed the styles of the Renaissance, which enjoyed a resurgence in popularity during the Victorian era. 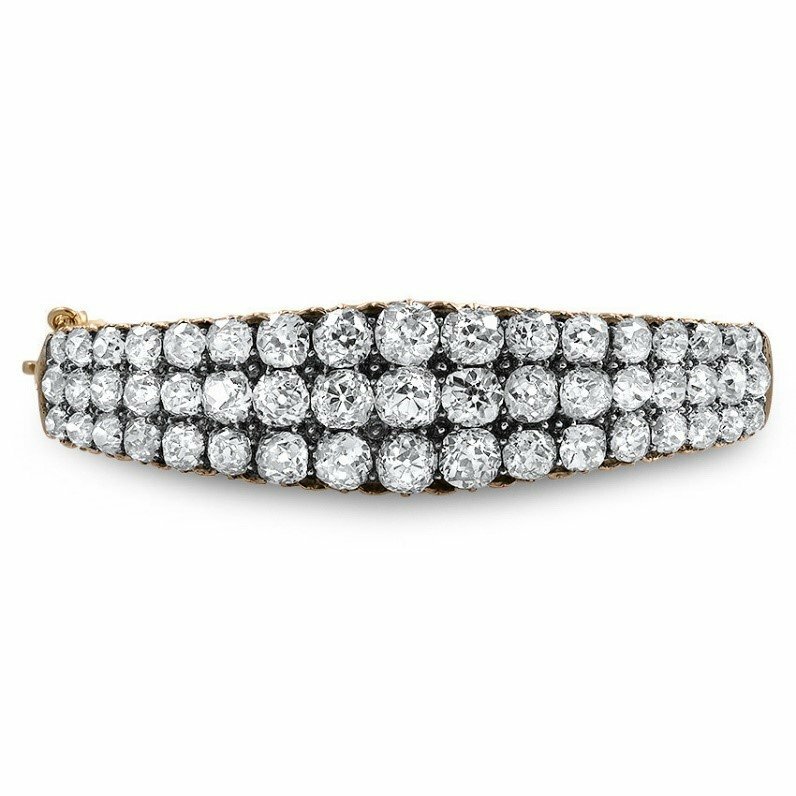 During the early decades of the Victorian era fashion often had women covered up from neck to wrist, so brooches, bracelets and rings were the most popular jewelry styles. But in the final decades of the nineteenth century women’s clothing became slightly less prim, exposing collarbones and creating a demand for beautiful pendants. 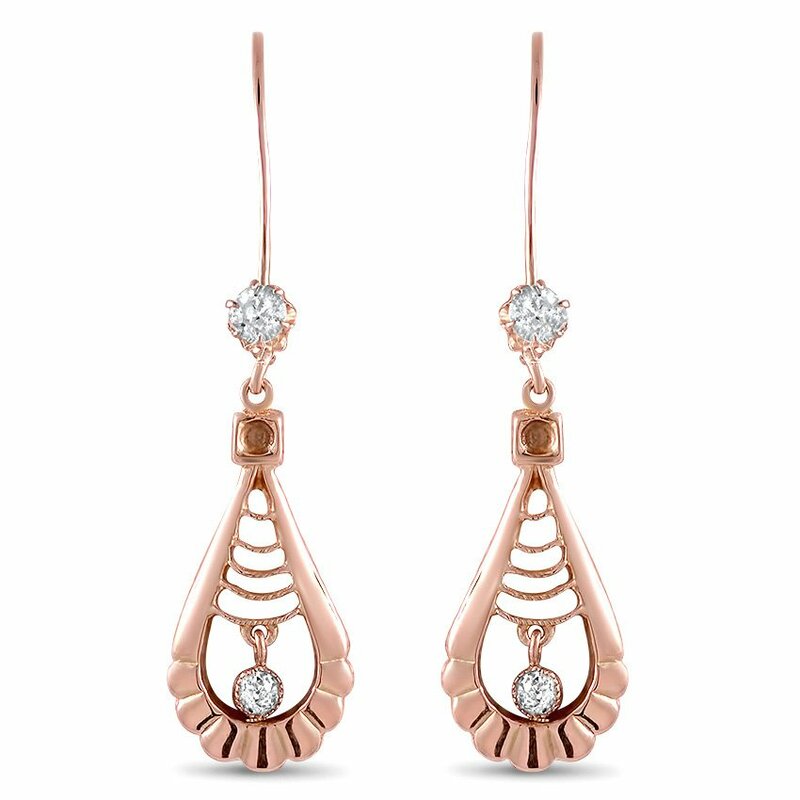 Upswept hairstyles lead to the renewed popularity of earrings. 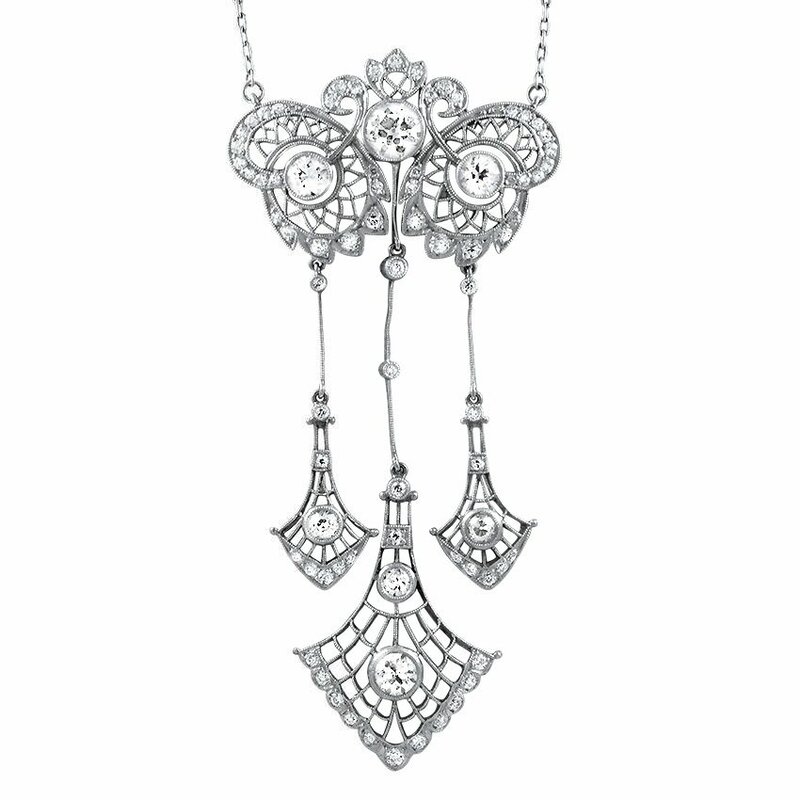 Victorian pendants and earrings often feature semi-precious gemstones and pearls set in ornate but delicate designs. During most of the Victorian era, nearly all fine jewelry production took place in Europe. But that started to change in the in the mid-1800s, when America’s Tiffany and Company began producing jewelry and participating in international exhibitions. In 1886 Tiffany introduced the diamond solitaire ring, making history and helping to put the United States on the jewelry design map. When Queen Victoria passed away in 1901 her son Edward assumed the throne, ushering in the Edwardian era. 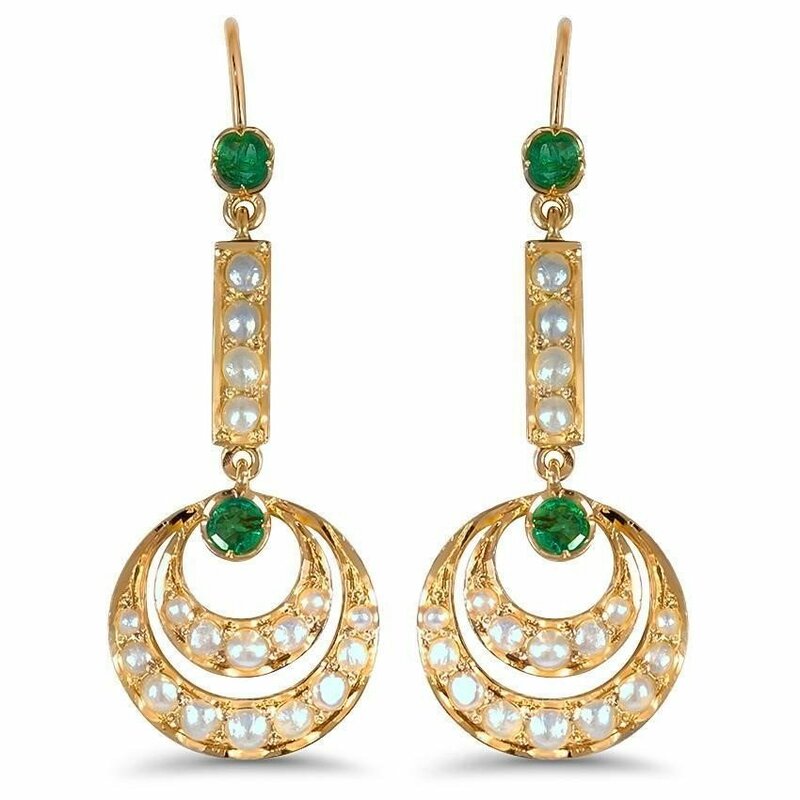 The Victorian era was an exciting time in history, when the world saw the advent of electricity, automobiles and, of course, a wealth of beautiful jewelry. Do you love vintage jewelry? Which one of these Victorian jewelry pieces is your favorite? Let us know on Facebook, Instagram, or Twitter, or in the comments section! Did you already erase the first comment, if so you are a hox, nothing true about your jewelry sales items. N we are finished, I will shop elsewhere. My wife loves very vey fine high career jewelry, with pure sterling silver. No substitute will ever qualify, for her.